Jnior Akilan Arunachalam played singles for the team against Orange Lutheran, where the Brahmas lost in the close match, 11-7. 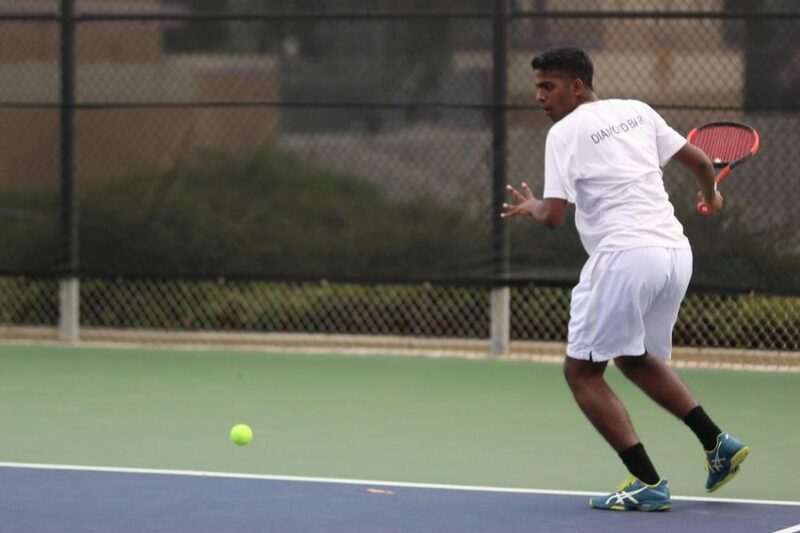 After making CIF playoffs last year, the Diamond Bar High School boys tennis team is aiming not just to win, but to master new skills and become better players in the process. The team is currently 3-6 in the season, in mostly non-league matches. Although the Brahmas lost all but one—winning 16-2 against Glendora—of their non-league games, the team has won both league games so far, defeating Don Lugo 13-0, and Montclair 15-3 . With different skills brought by every player on the team, awareness during games and practices have elevated the players’ performance during their matches, Wong said. Continuing the tradition set by previous varsity boys tennis coaches Carl Flint and Dave Hamel, Wong gives a lecture on tactics of the game almost every week. He also assigns a match report after every game to increase the players’ awareness of their own games. To keep practices interesting, the boys have a “challenge system” every Friday, where players challenge someone a rank higher to take their spot. Wong said he believes the seniors this year have all stepped up to fill the shoes of last year’s seniors. Chai said that the team is good at adapting to different game styles, but can use improvement in adjusting to playing doubles. “They’ve done a good job learning the doubles gameplay, but there is still a lot of practice, whether it be volleys, overheads, poaching and communication,” Chai said. With returning players guiding the team, senior captains Chai and Royce Park contribute leadership to the team. Due to the strength of the team, even some of the best tennis players are the team’s backups. Even though the team has lost almost all of their non-league games, they purposefully scheduled higher-ranked schools to gain experience. “Ever since our league has been shifted down, we needed to find a new way to challenge our players and improve their skill sets,” Chai said.